After over 20 people were killed and 45 injured in the Ramses Railway Station train crash last week, the country inevitably began debating the causes of the tragedy. But how can you prove beyond doubt that one action leads to a specific outcome, and if it is just probable causation, then when does the action determine the outcome in some cases but not others? When does correlation means a causation, and when does it not? Where does the ripple effect begin and where does it end, if ever? Unfortunately, there is not, and probably never will be, an agreed upon answer to these questions about multifaceted social phenomena. The issue of causation is one of the most contentious in social research and statistical work. However, in order to manage all aspects of life, there is no way around having to deal with this problematic terrain. How can we go about our lives without trying to identify what kills us, makes us poor, etc.? 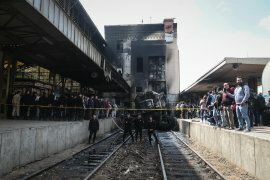 The debates about the responsibility of the recent train crash in Egypt also remind us that the issue of causation is not void of political and ideological bias.